From the nearby windows of a Jeep, we watched the gazelle gently clean her tiny newborn, and then walk away. The newborn was too weak to move, so the mother came back, and walked away again. Back in the Jeep we were quietly cheering for the baby gazelle — “Get up, get up!” — because we had seen lions and hyenas in the area, and knew the calf wouldn’t last long where it was, out in the open. The mother came back and this time the newborn tried to nurse — and the mother walked away again. Finally the baby was on its feet, moving on wobbly legs, and we breathed a sigh of relief knowing its mother would soon find a good hiding place for it. I and a group of friends had been travelling across the Serengeti savannah, when our eagle-eyed guide and driver spotted a Thomson’s gazelle lying down in the grass. Although I’ve had many wonderful close encounters with wildlife, this experience on my African safari is one of the most memorable. I suppose it reminded me of the newborn calves I saw growing up on my family’s dairy farm. If not for the care of their mothers, and of course their human caretakers, they would not have survived. Growing up on a farm inspired me to study biology in university and I was fortunate to take courses in ecology — a new and exciting field in the 1970s. 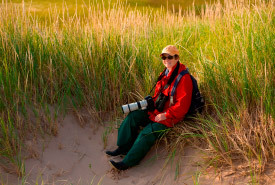 From my ecology professor, I learned about the interconnectedness of habitats and species, which led me to conservation and NCC. While I have been fortunate to see wildlife in many places throughout the world, it never ceases to amaze me how rich Canada is in wildlife. Without habitat, there would be no wildlife — it is that simple. The work done by the Nature Conservancy of Canada (NCC) helps to ensure that our country will continue to maintain habitat. Although we saw many other animals on that trip — and even had one of our camp chairs nibbled by a hyena outside our tent — it was that birth, and the vulnerability it exposed, that impressed me the most. I remain extremely proud of my work with and connection to NCC. I believe we all have a role to play in conserving and caring for natural areas to allow many native and at-risk species — including moose, mountain goat, Blanding’s turtle and many species of birds — the opportunity to be born and raised to maturity in the habitats they require to survive and thrive.